This tea is a blend of Gingko Biloba with green tea. Only the highest grade Gingko and green tea leaves that grows above 1700 meters in the mountainous area of En Shi were used to create this blend. En Shi is renowned for its rich selenium soil and is home to numerous types of Chinese medicine plants. Gingko tea is prized for its properties to improve memory, reaction time and mental clarity. It is also known to increase blood circulation, metabolism and helps relax constricted blood vessels. It has traditionally been used to treat circulatory disorders, memory loss (Alzheimer’s disease), macular degeneration, glaucoma and tinnitus. 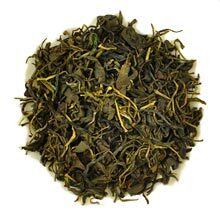 This tea is certified organic by Organic Tea Research and Development Center, China. The tea is refreshing with fruity sourness in the taste and a subtle sweet fragrance in the aftertaste. The Gingko and green teas leaves are tightly rolled together. The gingko leaves are very young and tender (harvest time is about 10 days).